This unique device protects extension and power cords from accidental unplugs and wet greenhouse or outdoor weather. When you connect extension cords, simply snap this protector around the connection to seal it tight. 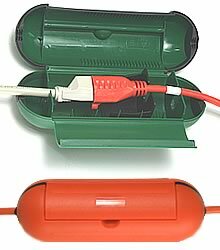 The extension cord cover has an internal locking mechanism that holds cords securely together and a weatherproof rubber gasket protects the electrical connection from rain, snow, misting systems, and sprinklers. Inside cord connector adjusts to 23 different sizes to keep cords snugly connected. Simply plug cords together, set adjustable cord connector, snap case shut, and your done. Inside dimensions for cord connection area: 5 1/2" x 2"
Extension cord covers are available in Green & Orange. Colors can be combined for quantity discount. Email us for bulk pricing. 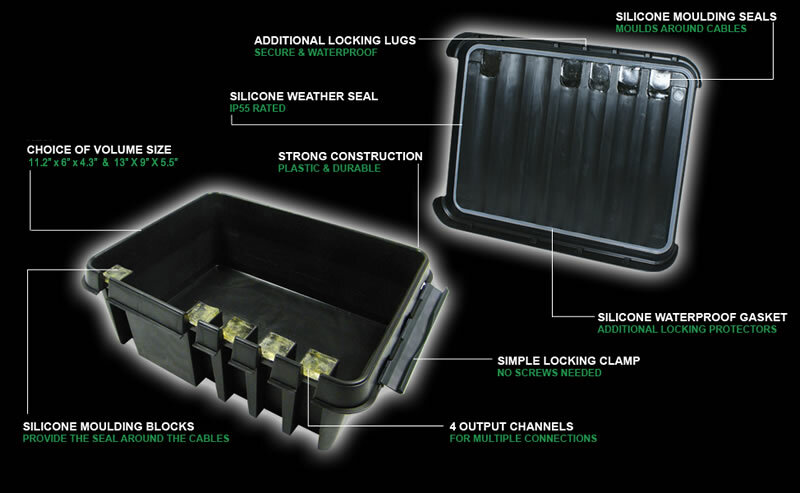 These plastic all-weather boxes have patented seals to keep out moisture and dust from temporary electrical connections. They also have large spaces to hold extension cord reels, surge protectors or power strips to plug various connections from greenhouse equipment such as fans, heaters, timers, thermostats, etc. and other items like outdoor christmas lights and water fountain pumps. These waterproof boxes are simple to use, quick to set up, lightweight, and portable. NOTE: The Mini box only has 1 inlet and outlet for a cord. The others have 1 inlet and 4 outlets. Mini 7.8" x 3.5" x 3.5"
Small 11.2" x 6" x 4.3"
Large 13" x 9" x 5.5"
. What is a GFCI outlet? A Ground Fault Circuit Interrupter (GFCI) is a safety device to protect against electrical shock by cutting off the flow of electricity when there is even a slight stray of current leakage. They are commonly required for outlets that are used outdoors or wherever electrical equipment might come into contact with water. End of Life Protection: If these GFCI outlets are can no longer provide ground fault protection, they will no longer provide power and will indicate this with an LED light. Reverse Line-Load Miswire: Power is denied to the receptacle if it’s miswired. Any fault or miswiring will also be indicated with an LED light. 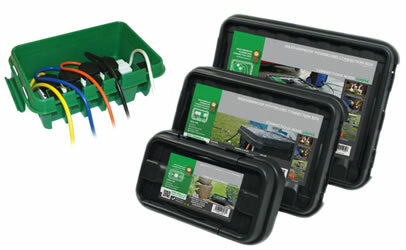 These kits include a waterproof electrical box, 110/120 volt duplex outlet, and waterproof In-Use cover. You have your choice of the standard cover which is 2 3/4" in depth or the deep cover which is 4 3/4" in depth. The deep cover allows the use our ACF prewired controls including our prewired thermostat, speed control, and humidistat. Kits are available with standard or GFCI duplex outlets. Weatherproof In-Use covers are available by themselves and will fit on any standard outdoor outlet box. 14 gauge stranded wire is rated to handle 15 amp circuits. It is available in black, white, green, and rolls including all three colors. Forget all the tools needed and hassles of dealing with rigid conduit! 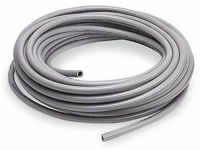 Our flexible conduit meets or exceeds all the same requirements as rigid plastic conduit while being able to easily bend, can be cut with a razor blade, and fastened to connectors and equipment with only a flex connector (No glue needed). UL listed for wet/outdoor locations. Flex conduit connectors fasten to flexible conduit creating a watertight seal and attach the conduit to electrical boxes, T's, and equipment with standard 1/2" threaded pipe connections. This threaded T is made of rustproof aluminum and is used to provide flexible conduit connections to multiple pieces of equipment. The assembly includes a removable cover for easy wiring and rubber gasket to provide a watertight seal. These aluminum conduit clamps won't rust and conduit can easily slide through them when loose without being damaged thanks to the rubber cushion. Clamps can be secured into the aluminum channel of Juliana greenhouses with oval bolts and Cross Country greenhouses with 1/2" cross country bolts.